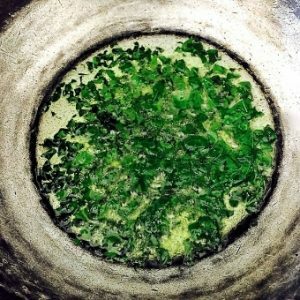 This is the first of a series of posts on this blog, on using the nutrition rich moringa leaves and drumstick pods in simple and delicious dishes. Nature has in her bounty, given us this tree offering nourishment and means to fight disease. We can easily make good use of this richness. 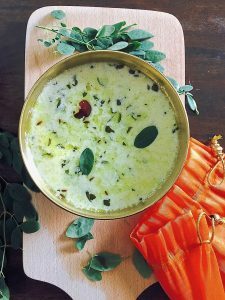 The Murungai Keerai MoreKuzhambu is an extension of the morekuzhambu or yogurt/ buttermilk stew. This is made in Tamilian and Kerala homes, though known by different names and with slight differences in the making process, in each of the States. Living in Bangalore has extended and enhanced my culinary skills, because I have access to a large variety of fresh produce. The ‘exotic’ ones not commonly found in India are of course more expensive than the local produce. I do not buy imported fresh produce but stick to those grown domestically. However I have easy reach to the moringa leaf, a common local ingredient. Our apartment garden has a tree which is flourishing and I can get a sheaf of the leaves whenever I want. The murungai keerai morekuzhambu is not a good recommendation for those who want to reduce food portions at meal times, because it is so very tasty, its difficult to stop at one serving! The tadka of coconut oil enhances the flavours of buttermilk cooked in coconut cumin chilli paste. The leaves have a high nutrient value, rich in minerals and vitamins, and have been used in some countries for fighting malnutrition in children and adults. In this recipe, the leaves are lightly sautéed, which would decrease the nutrient value as compared to adding fresh leaves directly. 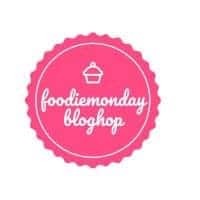 The theme for the 179th event of Foodie Monday Bloghop, is FoodMagBest. 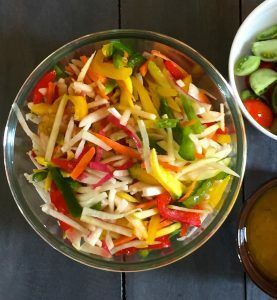 The theme, suggested by Seema (more about her blog, below), was for us to write a post with an image we would like to appear on the cover of a Food Magazine. I thought a lot about what I would post. Then I wondered, what recipe of mine would a reader like to see on the cover of a popular upscale food magazine? It has to have something about nutrition and health. It has to be something that the reader can see himself preparing at home, from everyday ingredients, and yet have something special. The murungai keerai MoreKuzhambu seemed to tick all the right boxes. 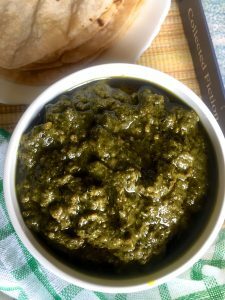 Easy, simple and yet unique because of the addition of nutrition rich drumstick or moringa leaves. Seema, whose name I mentioned above, writes a very lovely blog, Mildly Indian. 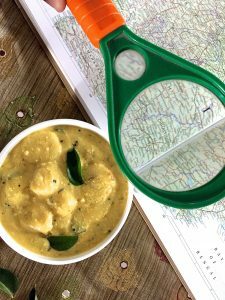 Browsing the blog, you will see a variety of recipes, Indian and International, with posts on her experiences during travel. There are delectable dishes like Pumpkin chai Popsicles and a 5 Minute Pavlova Parfait! Do visit and check for yourself. The murungai keerai morekuzhambu does not take much time to prepare. If you have grated coconut and murunga leaves available, then the process is very easy. 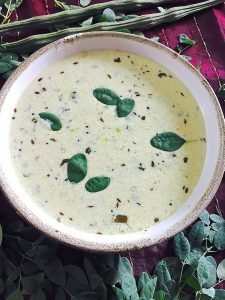 Do try the recipe and let me know how you liked it!